Kung hei fat choi! - Happy Chinese New Year! Squirrels have been learning about Chinese New Year and the year of the Pig. After listening to the Emperor's tale of how the years got their names, they decided to make a Chinese Restaurant. Many orders have been taken, writing down numbers and serving customers. Following on from this, today we made and tasted 'Stir Fry' and wrote down the ingredients we used. SNOW DAY - Some ideas for home learning. Squirrels, you get to stay at home with your grown ups and play in the snow. Wrap up warm and go outside to feel the snow and maybe make a mini snowman or even an igloo. Can you see any footprints in the snow? Where did they come from? Was it some kind of animal? 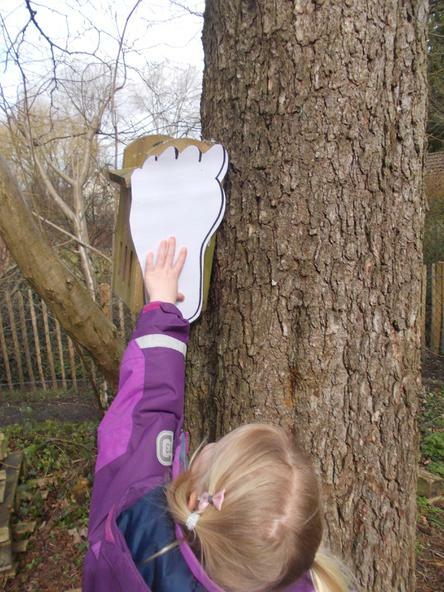 Count these footprints, - make some of your own and compare size. Can you write the word SNOW in the snow and think up as many words to describe the snow? Write the word SNOW and list as many words as you can that begin with each of the letters. Make symmetrical paper snowflakes by folding a white piece of paper diagonally and then twice more to form a triangle, then create a crystalline design by cutting that's revealed when you unfold the snowflake. Make the most of the extra time to read and practise all sounds and words too. Treat yourself to hot chocolate to warm up, stay safe, be good and have fun. Can't wait to see you all on Monday to hear all about your day. 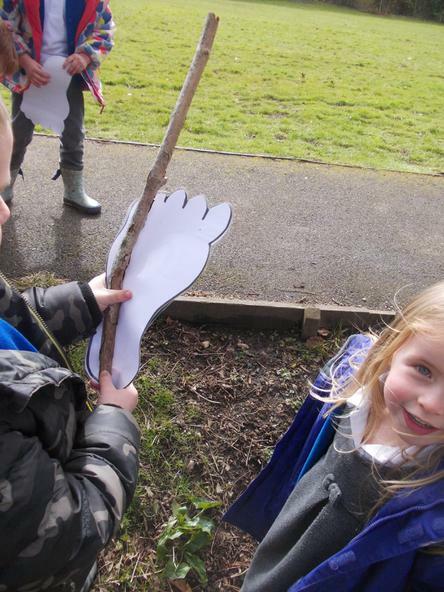 Squirrels have had lots of fun learning the 'Enormous Turnip' story. They made their own turnip and retold the story. 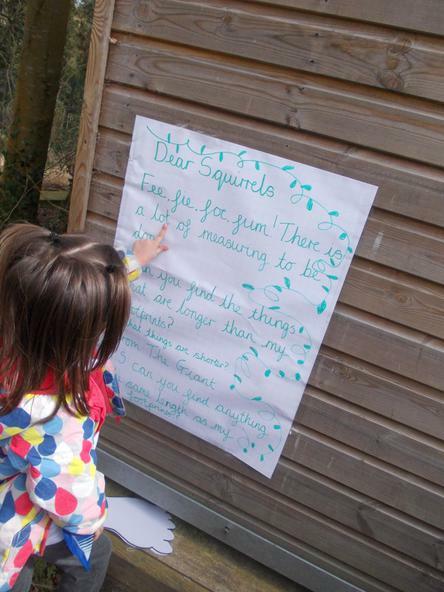 Squirrels found a surprise note near to the woodland walk and had fun with measuring. During the Spring half term Squirrels Reception Class have had lots of fun doubling and halving amounts, as well as learning to count in 2's, 10's and 5's. They have also been out and about looking for signs of Spring. Looking for signs of Spring. 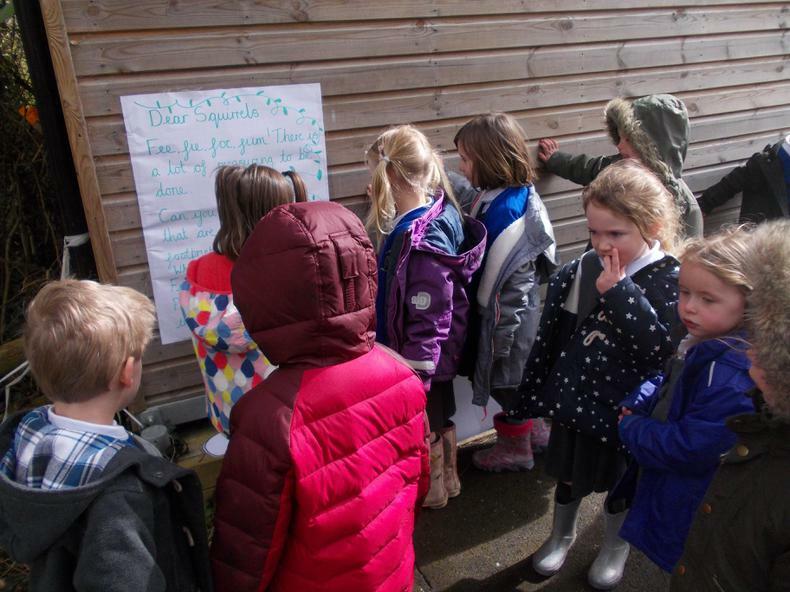 Squirrels had lots of fun enjoying the Spring sunshine in the school garden. 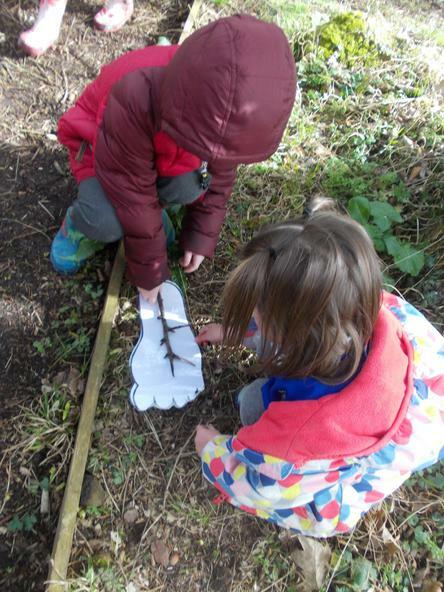 Sweeping and clearing, writing signs and planting more seeds, as well as bug hunting and dinosaur play.